The Box Hill Hawks are pleased to announce the re-signing of Mitch O’Donnell. Frustrated by injury setbacks that have derailed the bulk of his 2016 and 2017 campaigns, the man known as ‘Bull’ has enjoyed a full pre-season to date and will return for a fifth year in Brown and Gold – though he admits the decision wasn’t straightforward. “(Coming back) this year wasn’t an easy decision. “I weighed up my options and took my time, but having missed a lot of footy through injury, I felt as though there’s unfinished business for me. O’Donnell’s return to the senior side late in 2017 provided fans and coaches a reminder of what we’ve missed, with serious injuries back-to-back, first to his knee and then shoulder, obscuring the hard-headed inside-mid from view for so long. Following just one outing at Development level, O’Donnell returned to the senior side for round fourteen’s win over Werribee and played seven of the final eight matches of the year. Whilst the season mightn’t have ended how he hoped from a team perspective, his return was cause for optimism that, finally, things might go his way. “2017 was a pretty frustrating season. At the start of the year I had the goal to come back and have a strong season following my knee injury, but ended up hurting the shoulder and spending more time on the sidelines. It’s that perspective and determination – to look forward whilst still being driven by a premature end to the season – that has O’Donnell fit and firing on the track in the lead-up to the Christmas break. “So far pre-season is tracking well. I’m feeling great, I’m running well and really hoping to remain injury free; the shoulder is one hundred percent and I haven’t noticed it at all. 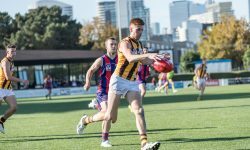 On the cusp of his fiftieth senior game for the Club and with a marked turnover of playing personnel in the off-season, ‘Bull’ recognises and embraces the role he can play as a leader in this new iteration of the Box Hill Hawks. “(The dynamic) is a lot different this year with quite a few new boys and a smaller list. “It was a little quiet early on, but as we got to know one another and it started to click training has really stepped up. “Personally, I’m looking forward to being a leader this year. There’s a big hole with Dave (Mirra) being drafted, so it’s important us senior players step up and pick up the slack. As 2018 fast approaches and competitive matches edge ever closer, O’Donnell has simple goals for the season to come. “I want to get through a healthy pre-season and try to cement my spot in the team for the whole year. “I know my best footy is good enough to be selected each week, I just need to make sure I’m doing all the work and playing my role for the team. “And, importantly for all the boys, I want to build on what we established last year on and off field and make the Club an environment everyone wants to be around and involved in.